A graduate student’s regalia includes a hood made of velvet and satin. The color of the velvet panel signifies their field of study. 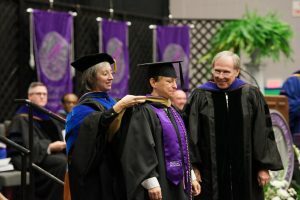 Dr. Barlow, the Graduate Dean, is shown “hooding” a student during the commencement ceremony. Your hard work has paid off as you are about to finish your journey toward an advanced degree. The following information will guide you through the steps to prepare for graduation. Ceremony time: 7:00 p.m. Farris Center. Arrive one hour before this to line up. The graduation application deadline for graduate students who will complete all of their degree or certificate requirements during spring term 2019 is February 8, 2019. Presently, applications should ONLY be submitted for those graduating in May 2019. Graduate students do NOT apply a year in advance as undergraduate students do. NOTE: While the commencement ceremony for graduate students will be held on May 3rd, the official graduation date on transcripts and diplomas will be May 4th. How do I apply to graduate (Master’s, Specialist, and Doctoral degrees)? View your Degree Works audit. If any classes in the “Fallthrough” section should be included in Degree Requirements, a Degree Works Management form (https://uca.edu/graduateschool/files/2017/12/Graduate-Level-Degree-Works-Management-Form.ext_.pdf) should be submitted and processed prior to submitting your application. Please consult with your advisor if you have any questions about degree requirements. Login to myUCA and under Self-Service select – Student. Select – Apply to Graduate –Masters, Specialist, Doctoral Degrees, and Graduate and Post-Masters Certificates. For Curriculum Term Selection choose the most current term. If the program curricula is inaccurate, please contact the Graduate School at ucagradschool@uca.edu to request the change. Do not submit a graduation application until the curricula is correct. If the curricula is correct, select the program and continue. For Graduation Date select the current term. For Diploma Name select the name that you want to appear on your diploma. This name can be edited. NOTE: This name will also be used on your graduation name card which will be announced at the commencement ceremony. For Diploma Mailing Address select the mailing address for the diploma. If the information is inaccurate, the information can be edited. REMINDER: Since diplomas will be mailed approximately 12 weeks after the end of the semester, use an address that will be correct at that time. Students wishing to have diplomas mailed out of the country must come by the Graduate School office to complete a customs form and mailing label. On the Graduate Application Payment page, for Payment Method select Graduate Graduation Application Fee $40. This will apply the charge to your student account. On the Graduation Application Summary page, review the information for accuracy before submitting the application. If anything is incorrect, use the back arrow and correct any errors. A $40 fee will be posted to your account and you will get a confirmation that the application has been submitted. Diplomas will not be available until this fee has been paid. Failure to apply before the end of the term will result in a delay of degree award by one semester. Students will receive an email within three weeks confirming receipt of the application. If all degree requirements (i.e. completion of all coursework, comprehensive exams, final approval of thesis by the Graduate School, removal of X grades, etc.) are not completed by the end of the term (the last day of final exams), the student must submit a new application to graduate in the subsequent term when ALL the requirements have been met. How do I apply to have my Graduate or Post-Master’s Certificate awarded? If the program curricula is inaccurate, please contact the Graduate School at ucagradschool@uca.edu to request the change. Do not submit a certificate application until the curricula is correct. If the curricula is correct, select the program and continue. For Diploma Name (certificate) select the name that you want to appear on your certificate. This name can be edited. For Diploma Mailing Address (certificate) select the mailing address for the certificate. If the information is inaccurate, the information can be edited. REMINDER: Since certificates will be mailed approximately 12 weeks after the end of the semester, use an address that will be correct at that time. Students wishing to have certificates mailed out of the country must come by the Graduate School office to complete a customs form and mailing label. A processing fee will be posted to your account and you will get a confirmation that the application has been submitted. Certificates will not be available until this fee has been paid. Failure to apply before the end of the term will result in a delay of certificate award by one semester. Students will receive an email within three weeks confirming receipt of the application. If all degree requirements (i.e. completion of all coursework, removal of X grades, etc.) are not completed by the end of the term (the last day of final exams), the student must submit a new application in the subsequent term when ALL the requirements have been met. The deadline dates for submission of this application and fee are the same as those for filing an application to graduate. Students receiving Graduate or Post-Master’s Certificates do not participate in commencement but will receive a printed certificate. Failure to meet the deadline may result in the delay of the certificate being awarded by a semester. What do I need to do prior to the commencement ceremony? Order your cap, gown, and hood: Regalia must be ordered through the university bookstore; contact the bookstore for more information (501-450-3166). NOTE: Undergraduate gowns are distinctly different and may not be worn by graduate students. Pick up your name cards: NAME CARDS (there will be two) showing each degree candidate his/her place in the procession line may be picked up between the hours of 8:00 a.m. to 4:00 p.m. in the Graduate School office (Torreyson West 328) during the week of graduation. BRING THESE NAME CARDS TO THE COMMENCEMENT CEREMONY! Your name will be read from this card during the conferring of degrees. The second card is for the sign language translator. Incomplete Grades & Transfer Credits: Official transcripts showing outstanding transfer credits and final grades for all incomplete work credit should be submitted to the Graduate School as soon as possible. The final degree audit cannot be performed until this is accomplished. Clear up University Accounts: All outstanding accounts with University Offices should be cleared as soon as possible. A restriction will be placed on the academic record of any student with outstanding debt to the Business Office, Library, Bookstore, Health Services Office, or University Police. Complete an Exit Interview: Student Financial Aid (450-3140) and/or Student Accounts (450-5015) may require an exit interview of students participating in student loan programs. Please contact these offices for specific details if you believe this may be applicable to you. Verify your address: Your diploma will be mailed to the address you gave on the graduate application. Address changes MUST be made in writing to the Graduate School prior to graduation in order to ensure the proper delivery of the diploma. Order Announcements and Class Rings: May be ordered through the UCA bookstore in the Student Center. When will I receive my diploma or certificate? The diploma or certificate will be mailed to the address given on your application form approximately twelve weeks after graduation. Once final grades are reported by the faculty, the Graduate School will review each candidate’s application for degree or certificate completion. The final completion of all requirements must be indorsed before the degree can be awarded and the diploma or certificate printed. The diploma or certificate is printed with your name (as listed on the application), the degree or certificate awarded, and the date the degree or certificate is awarded. If your diploma or certificate mailing address changes prior to this please send an email with the new address to slburks@uca.edu. Changing your address on myUCA does not update your diploma or certificate mailing address. Notify the Graduate School in writing if you have not received your diploma or certificate after the twelve weeks has expired. NOTE: The University of Central Arkansas is not responsible for damage or loss that results from the actions of the US Postal Service.